Hanson Chiropractic offers leading edge treatment for neck pain in Everett WA. Our advanced team of chiropractors have been trained in the various causes and treatment of neck pain. A few causes of neck pain include whiplash, work injury, and more. If your neck is pain make an appointment today to get seen by a specialist and set you on your way to living pain free without painful or risky surgery. What is the Cause of My Neck Pain? There are several reasons you may be experiencing neck pain, some of which could cause your pain to vanish just as suddenly as it appeared. Rather than risk your health and be in pain longer than necessary, it’s best that you learn to recognize the signs that your neck should be looked at by a licensed and experienced specialist here at Hanson Chiropractic. 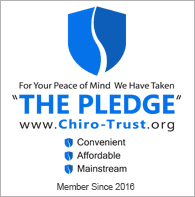 There are a few things you can do on your own to see if your pain can be managed by more conventional means that don’t require the intervention of a chiropractor. Apply an ice pack to the part of your neck that’s giving you the most trouble. For the best results, hold the pack to your neck for 20 minutes before leaving it off for at least 40 minutes, alternating back and forth for the best results. It’s best that you support your head with a firm or extra firm pillow rather than a soft or flat pillow. Flat pillows only serve to bend your neck into angles and positions that are likely to cause you pain. While you might be able to sleep with a poor pillow, you’re certain to have a stiff and sore neck in the morning. Taking out some time to exercise your neck may be just what you need to get rid of the kinks. Raise your arms and bend them at 90-degree angles before relaxing your shoulder muscles and tightening the muscles between your shoulder blades. You can also turn your head from left to right until your nose is positioned just over your shoulder. Another effective exercise is to tilt your head back until your chin is pointed at the ceiling, only going back as far as is comfortable. Perform these exercises before going to bed and when you wake up. You may not notice just how much you use your neck while driving until the discomfort becomes a danger. Checking your blind spot, looking over your shoulder as you’re backing out, and merging can require some serious head turning. If your neck is hurting, your driving abilities can be impaired, so it’s best that you avoid getting behind the wheel until you’re able to work your way through your pain. If you’ve tried all of the methods above and your neck is still giving you fits, it may be time to schedule an appointment with a chiropractor. A chiropractor is specially trained to safely and accurately assess and resolve issues with the spine and neck. Visiting one will let you know exactly what’s going on with your neck, if the problem is only with your neck and what you can do to get relief. When you meet with your chiropractor, she or he will most likely perform an examination to test your neck’s range of motion and see if there is any tenderness in your hands and arms. You can also expect specific questions regarding your pain. Be fully honest with your chiropractor about your neck pain and the potential cause behind it, no matter how embarrassing it could be to reveal the truth. Remember, your chiropractor is there to help you feel better, not judge you. If you’re impatient to wait until your appointment, or if you’d simply like to satiate your curiosity, there are a few potential reasons for your neck pain, such as a work injury from simply sitting at a computer desk. You may not be aware of it, but there are cushioning nerves between the vertebrae of your spine. If you ever throw your back out of alignment, your vertebrae can bunch against your nerves and cause you to have neck pain. Once you’ve successfully taken care of your neck pain, there are a few things you can do to keep it at bay in the future. Be sure you sit up straight, and if you work behind a desk, you may want to look into ergonomic office furniture. Additionally, it’s best that you take several short breaks throughout your workday to stretch your muscles. Invest in a quality pillow in order that you can get quality sleep. Your neck pain might also be related to stress or anxiety. You likely know the causes, so be sure you recognize your triggers and take action to mitigate the neck pain that commonly pairs with stress and general tension. Starting a regular exercise routine can also help mitigate your stress, tension and anxiety and help keep your muscles limber, which helps to stave off potential neck pain and other types of discomfort. Don’t wait too long to treat your neck pain; doing so could cause the situation to worsen and spill over into other areas of your life and body. The experts at Hanson Chiropractic are here to help give you the relief and answers you need and deserve. Send us a message or call us at 425-355-3739 to set up an appointment.